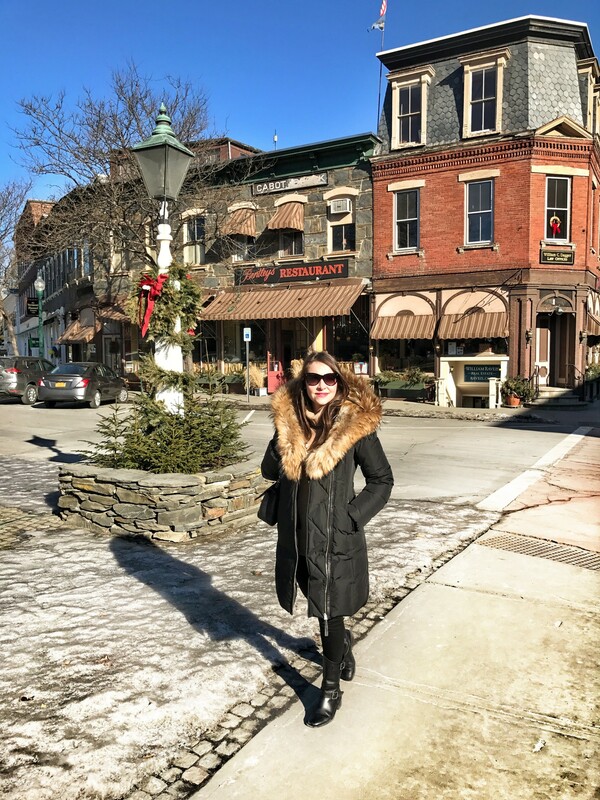 I fell in love with Woodstock, Vermont the very first time I saw it. 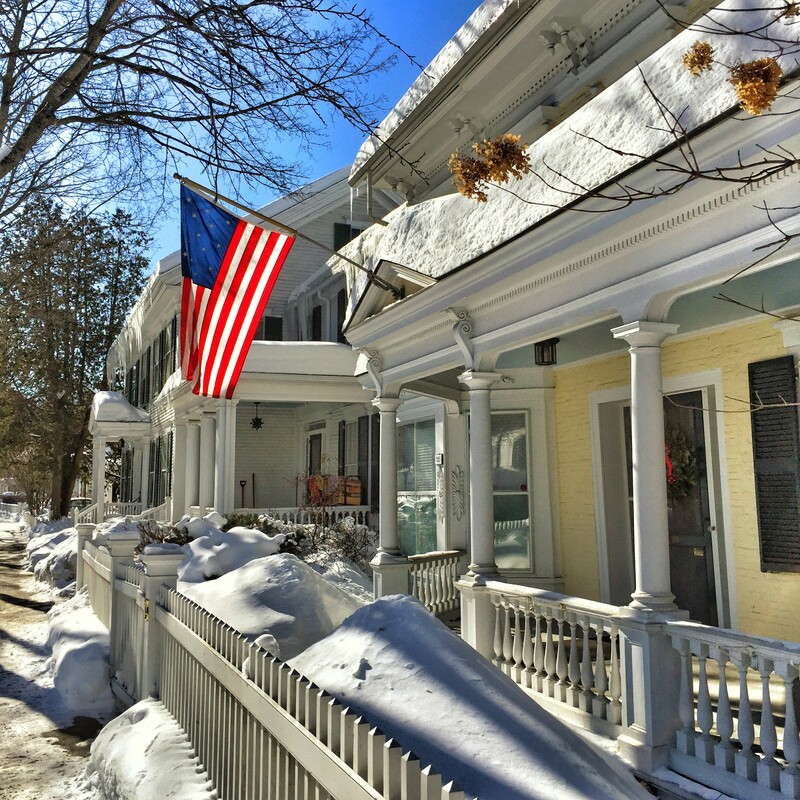 From the rows of gorgeous white houses complete with white picket fences to the picturesque covered bridges and a main street that’s filled with shops and bustling eateries, it’s hard not to be charmed by the beauty of this picture-book New England village. If you’re looking for a great weekend getaway that’s an easy drive from Boston, I highly suggest a visit to Woodstock. Ideal for both skiers and non-skiers, couples and families, this is a winter destination that truly has something for everyone; and once you spot your first glimpse of the snow-covered village, you’ll understand why it’s loved by so many. Oh, and a little bit of packing advice — don’t forget extra layers and warm boots! 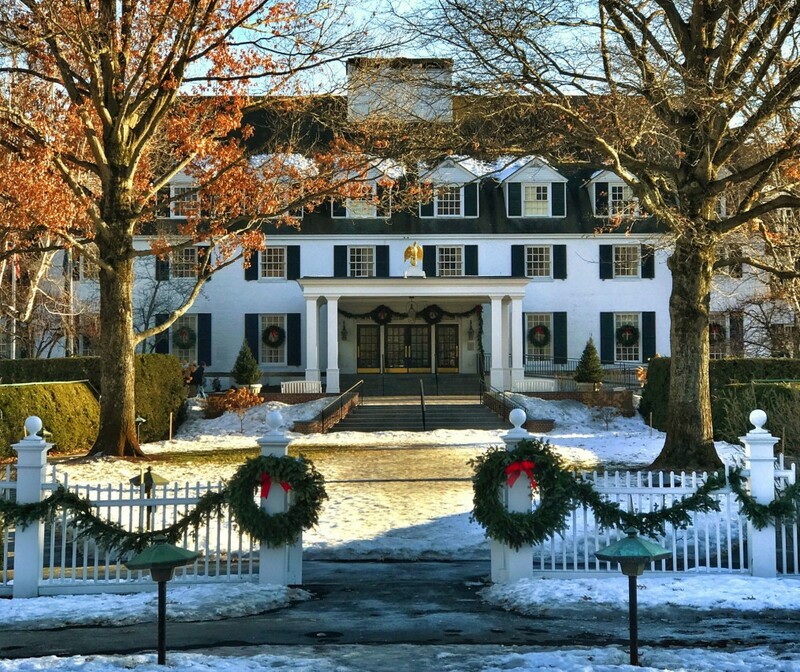 For a first visit to Woodstock, I highly recommend staying at the Woodstock Inn and Resort. Its location is prime, and the accommodations are luxurious yet still warm and inviting. 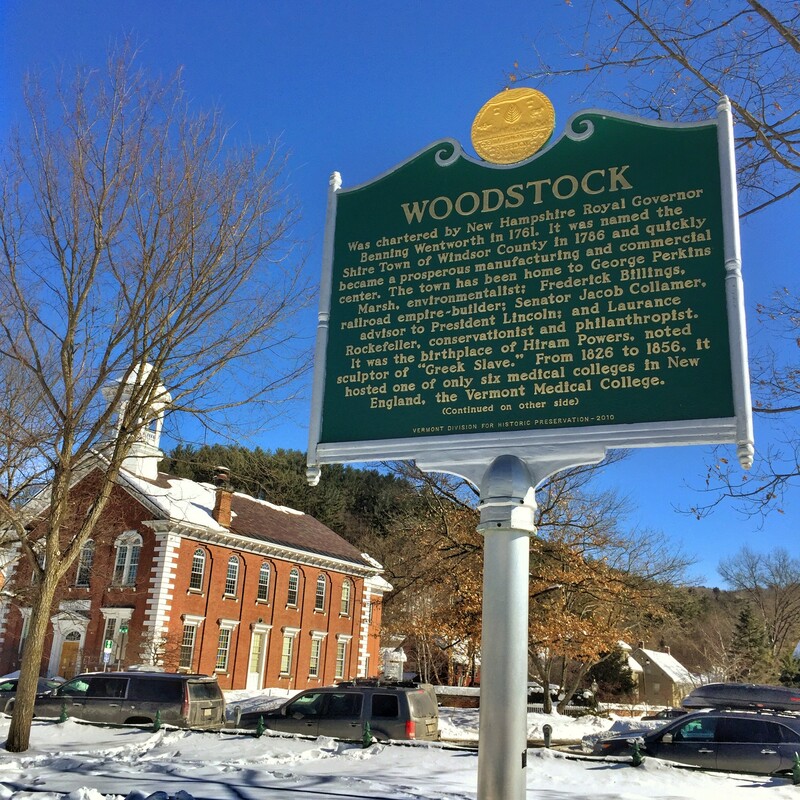 This historic, stately building has been a fixture in the town for decades and is one of the most iconic places to visit while in Woodstock. There are so many things that I love about this property, and I try to come back and stay here as often as I can. Whether it’s imbibing a hot toddy by the lobby’s wood-burning fireplace (don’t overlook the eagle above the fireplace; it’s from the original Eagle Inn, which once sat on the land! 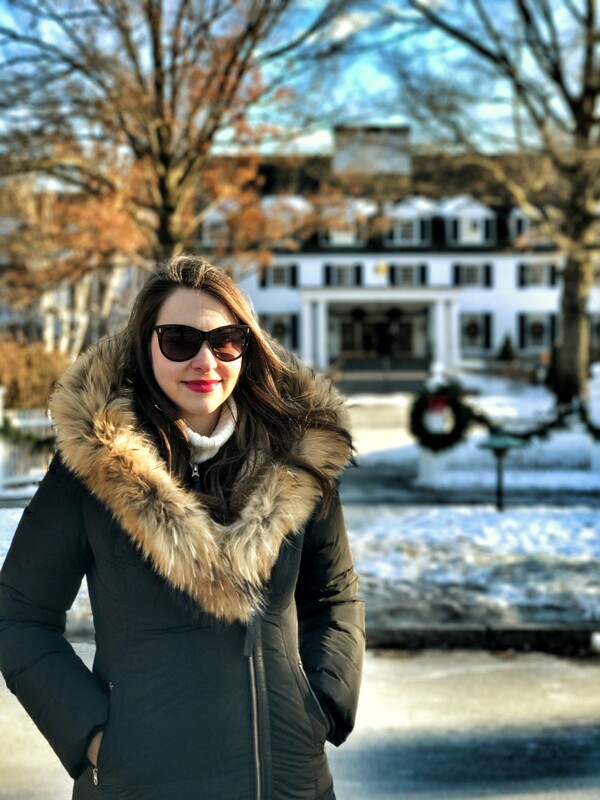 ), playing an intense game of checkers with my husband in the game room, or indulging in a relaxing spa treatment, a stay at the Woodstock Inn and Resort feels like a true winter vacation. If you’re up for an adventure, the Inn can assist you with making anything from sleigh ride reservations at Billings Farm & Museum to arranging a day on the slopes at the nearby Suicide Six Ski Area. Whatever you do, don’t miss the complimentary freshly baked cookies, tea/coffee, and hot cocoa that the Inn serves every afternoon! They are SO good! 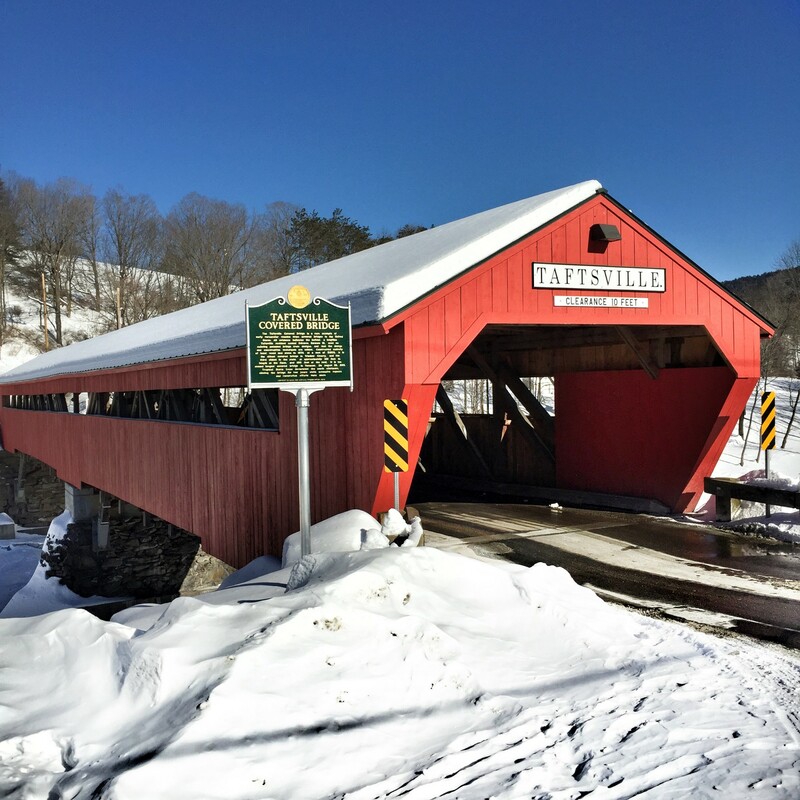 I still remember the first time I saw a covered bridge in Vermont; I was beyond delighted to see this quaint and quintessential New England structure! 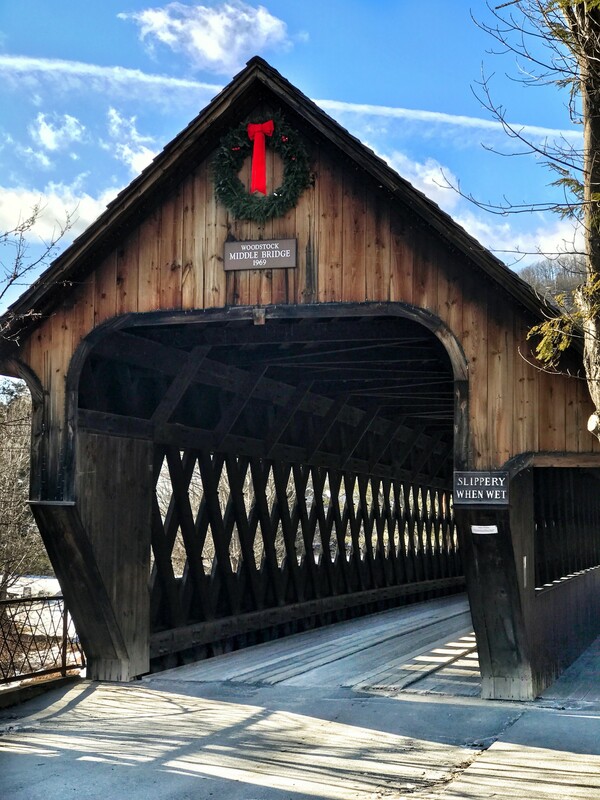 If you also have a mild obsession with covered bridges, you’ll be thrilled to know that there is a beautiful bridge right in the heart of Woodstock. Middle Bridge is 139 feet long and allows both cars and pedestrians to walk across Ottaquechee River admiring its beauty. Located right off the center of town, Middle Bridge may just be the most photographed place in Woodstock — in fact, it’s quite the feat to score a snapshot of Middle Bridge without people posing in front of it! Another one of my favorite covered bridges in the area is the Taftsville Bridge, which you can’t miss because of its bright red hue. 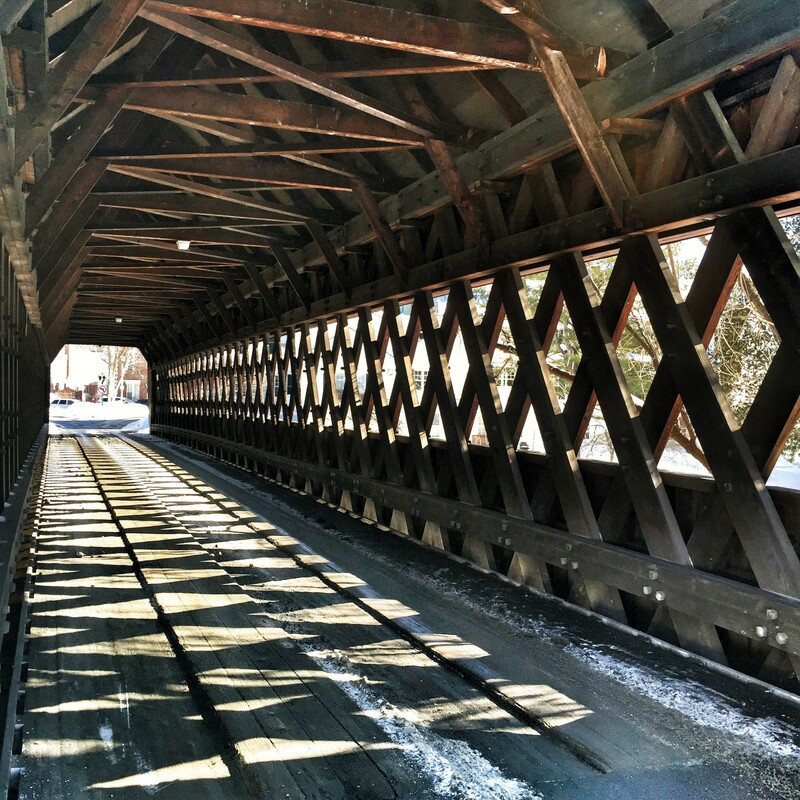 This is one of the oldest bridges in Vermont and it is 189 feet long! When the Taftsville Bridge is covered in snow, you feel like you are part of a Currier and Ives scene! To satisfy the tastes of every shopper, there’s an eclectic mix of retail stores in the downtown area of Woodstock. I absolutely love the historic Woodstock Pharmacy and FH Gillingham & Sons General Store, which literally sells everything under the sun. I also enjoy popping into Vermont Flannel Company (not a fan of flannel? this store will make you think again!) and Clover Gift Shop. For dedicated antiquers, I’d recommend taking a short drive to the Vermont Antique Mall in Quechee, where you will find a 17,000 square foot barn that’s filled to the brim with vintage treasures. For me, no shopping trip in Woodstock is complete without a latte from Mon Vert Cafe and an ice cream cone from Mountain Creamery. Yes, ice cream! Homemade and oh-so-delicous, I will never pass up a cone of their Vermont Maple Walnut, even in the dead of winter! A few miles away from Woodstock, in Quechee, is the Simon Pearce flagship. 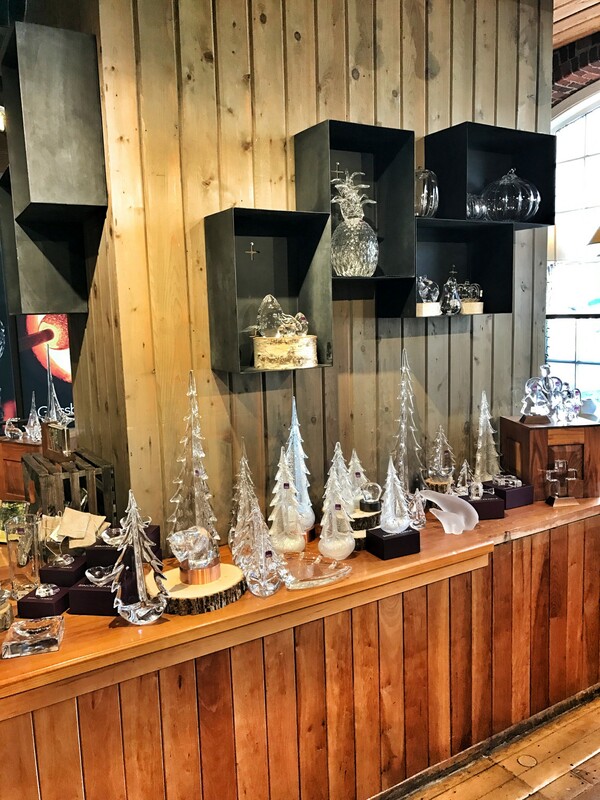 You could literally spend an afternoon there enjoying lunch overlooking the Ottauquechee River, shopping the brand’s stunning glassware (on my wish list is this striking carafe and this beautiful evergreen tree for the holidays), and best of all, watching a glassblowing demonstration! 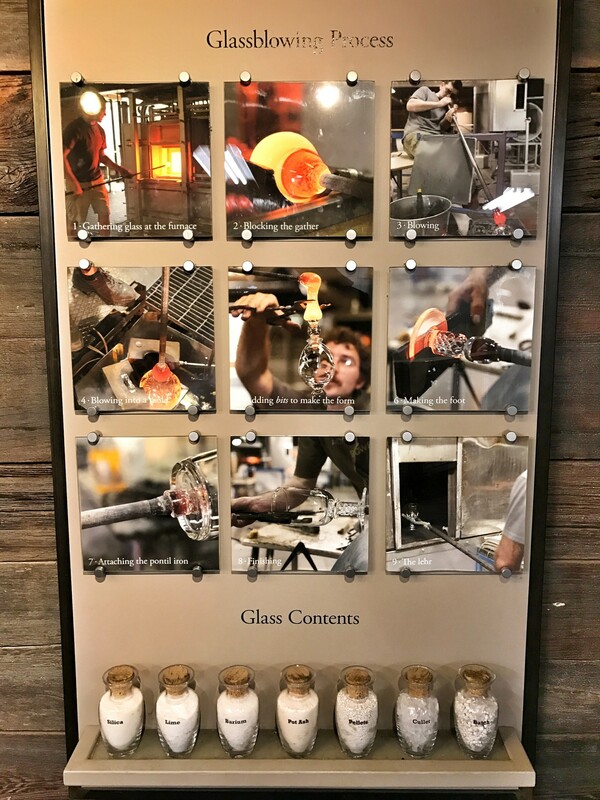 The mill offers you a firsthand look at how the glassblowers create the gorgeous pieces you see in the store. It’s a free, live action view that shows you, from start to finish, the difficult yet surprisingly quick process to make glassware. Also, while shopping in the Simon Pearce store, don’t overlook the discounted second-quality glass pieces. These are sold at reduced prices because they were made with tiny imperfections in the glass, but honestly, half the time you won’t even notice the error! What’s better than indulging in copious amounts of Vermont-made cheese and maple syrup?! While the “scenic” drive to Sugarbush Farm can be a bit daunting, once you’re there, you’ll feel right at home on these gorgeous 550 acres. If you have even the slightest interest in the sugaring process or how cheeses are hand-wrapped, hand-waxed, and shipped, this should be a must-see place during your trip to Woodstock. While I love the educational component of a visit to Sugarbush Farm, I really love the cheese and maple syrup sampling! You can sample four grades of maple syrup and learn about the process for making each (I personally never knew the difference between syrup grades before coming here!) as well as try out 14 varieties of cheeses (yes, 14!!) including a cheddar that has been aged for years. Just a warning – you will likely be going home with A LOT of cheese!